Parents of children with Dyslexia often ask me about a 504 plan for their children and just what accommodations their child is entitled to receive. A 504 plan for those with Dyslexia is helpful in providing the services to cater to the individual needs of the student. The Rehabilitation Act of 1973 Section 504 prohibits discrimination that is based upon a disability. Section 504 requires that a child who has a legal diagnosis and is attending either an elementary or secondary school is entitled to accommodations that will ensure their success academically. A 504 plan for those with Dyslexia is specifically for those in general education and who do not qualify for special education services. Provide audio recordings of books, including textbooks – Reading for students with Dyslexia is a cognitive task and because we can only do one cognitive activity at a time, they are working so hard decoding text that they are not comprehending what they are reading. Learning Ally is a wonderful resource that provides students with books via digital format, downloadable to iPad and Android Apps, or playable with their LINK software. Text-to-Speech Technology – Learning Ally is a valuable resource for this accommodation. Provide pre-exposures of reading materials – Allow the student with Dyslexia to take reading materials home before the reading block occurs at school, along with any vocabulary words that will be covered in the text. This allows the student to practice the passage with a parent and learn key vocabulary words ahead of time to set him up for success at school. Provide the student notice in advance of larger reading assignments – This allows her ample time to successfully complete this assignment. Allow speech-to-text software – Dragon Naturally Speaking software is an excellent resource for written expression accommodations. Allow student to verbally express himself – Perhaps an audio-taped version of a written assignment would allow the student to display mastery of the content he is learning. It is important to give the student ample time to complete this assignment to organize his thoughts and accurately present. Allow student to utilize a scribe – The student can say what he would like to express on paper to a scribe. He can also work with a team of students to complete a written assignment and assign a non-dyslexic team member to write the report. Do not grade hand written assignments based upon spelling errors – These assignments should be graded on quality of the content and not on encoding ability. Reduce number of spelling words for assessments – If spelling assessments are given for a grade, it is best to work toward an attainable goal and do not deduct points for handwriting mechanics, such as letter size and formation. Provide student with an outline of teacher’s direct instruction – It is very difficult for a student with Dyslexia to focus on a lecture as well as take sufficient notes. It is important to provide the student with the main points of the instruction. Provide a classmate with carbonless notebook paper – A classmate can provide the student with Dyslexia lecture notes by using carbonless notebook paper. Mayer-Johnson is a supplier of carbonless notebook paper. Allow use of a keyboard for handwriting tasks – An AlphaSmart portable keyboard, iPad (or any tablet), or a laptop computer are excellent resources to use in the classroom. Do not ask the student to copy information – Copying information from a textbook, overhead projector, chalkboard, or Smart Board is a difficult task for students with Dyslexia. It is important to provide this information for the student. Allow use of math manipulatives – A 504 plan for those with Dyslexia should include multisensory learning. Tangibly working through math problems with hands-on manipulatives promotes mastery of the concepts. Reduce the amount of homework – Elect a certain amount of time to be spent on homework each night. Check for student understanding prior to assigning homework – Homework should be a time for students to practice what they have learned in the classroom and not a time for parents to reteach concepts to their children. It is important for the teacher to check the student for understanding of the concepts taught in the classroom prior to assigning homework. Assessments given away from distractions – This is especially important for students with ADD. Provide plenty of pre-exposure to the concepts covered on an assessment – It is important to adequately cover the concepts to be tested, as well as do frequent checks for understanding prior to administering the assessment. Modify assessment format – Administering assessments that contain short answer or essay questions will be very difficult for your students with Dyslexia. A better format might be fill-in-the-blank questions with a word bank, matching the question with the correct answer by drawing a line from one to the other, or multiple choice type questions IF there are no more than 2 choices. Use of colored overlays – The glare that often results from white school paper causes visual strain for some students. Using light colored overlays for classroom assignments and assessments may be helpful to reduce processing strain. Use of highlighters to color code assignments and assessments – Using highlighters to organize assignments and tests may be helpful for some students to categorize content and minimize visual distractions. Fair – All students receiving what they need to reach their optimal success. Be an advocate for your students with Dyslexia – Let them know that you are there for them and that you will always be their advocate. Only ask the student with Dyslexia to perform a task you know he can do – If you are going to ask a student with Dyslexia to read aloud in class or ask him to write something on the board, be sure to consult with the student in advance to be sure the task is something with which he feels comfortable, making sure he fully understands what you are asking him to do. Make your classroom a place that is conducive to learning for all – All of our students are entitled to a free and appropriate public education in a safe learning environment. It is the teacher’s responsibility to create a venue where this is possible. Suggest the accommodations that best meet the needs of your student – Suggest accommodations for a 504 plan for those with Dyslexia that best meet the individual needs of your student. Identify the student’s strengths on a 504 plan for those with Dyslexia – Identifying the student’s strengths on a 504 plan is important because they can be capitalized on in the classroom, which in turn promotes student engagement and success. Encourage seamless lines of communication between home and school – Communication is one of the major key players in the success of a 504 plan. Understanding what works and what needs to be modified is the only way to create an effective plan. Be proactive in following through with the 504 plan at home – If it is embedded in your child’s 504 plan that s/he will work thirty minutes at home on homework each night, be sure to support this accommodation at home and be consistent, so your child knows what is expected. Communicate with your child’s teacher about what is working and what is not – Request a meeting when necessary to make changes to your child’s 504 plan. A 504 plan for a student with Dyslexia is fruitless unless the accommodations are appropriate to meet the individual needs of the student. Creating a 504 plan for those with Dyslexia does not have to be difficult. 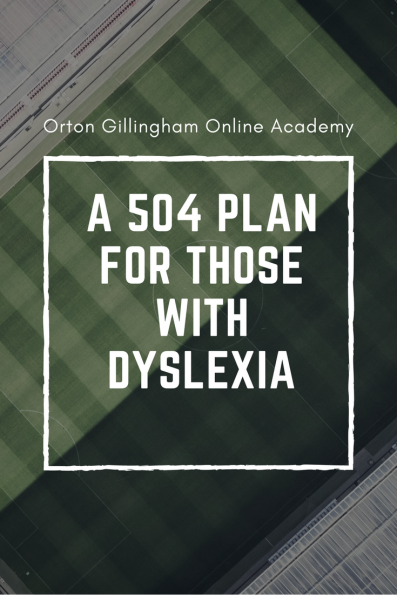 Collaboration between school and home is essential to creating an appropriate 504 plan; and just as important is implementing the plan as written consistently to provide the student with Dyslexia the support they need to be successful. I hope this resource is helpful for you as you strive to accommodate those with Dyslexia. Thank-you for your commitment and passion to make a difference in the lives of those who make up the 1 in 5 of our population.